For my second set of crochet braids, I went for a box braid look. If it's one thing that can be said of crochet braids, it's that they are so very versatile. Who ever would've thought that that old childhood style would come back better than ever? Not me. That's for sure. Or was I the only one whose mom braided her hair up and then put those fake curly braids in it??? Oh... ok. If you've never looked up crochet braids on YouTube, let me tell you - ladies do alllll kinds of things with this style. I seriously had no idea! Because of the fact that it has been working out well for me, I realized I could easily keep styling my hair this way for months on end without getting bored or having to repeat a certain look. With that, I'm sure I will get better at installing, too. I think I am going to be protective styling a lot longer than I originally intended. Especially since I am planning to cut 2-3 inches sometime this month. My nape is just thriving and that is no small matter. Of course, it's benefitting all the rest of my hair, too. I want to at least protective style through the summer, taking little breaks in between each style. I'm not sure if I am going to be using crochet braids that whole time or not, but I do know I want to do them at least one more time after this. So, to achieve the box braids, I used pretty much the same braiding pattern that I did the last time, but I switched up my technique of crocheting in the hair. Normally, you grab a loop of hair with the crochet hook, pull it through the braid, then pull the length of hair through the loop to create a knot. Instead of pulling the hair through the loop to knot it after crocheting it in, I pulled half of the hair through to the other side of the braid (pictured below). This way, once the hair is braided, it surrounds the braid (covering it), instead of creating a knot. It may not sound like it, but it wasn't any extra work to put the hair in this way and it actually makes the hair a little easier to take out. For those reasons, I think I like this technique better than the regular way when it comes to going for this look. I used a different kind of hair this time (Sensationnel X-Pression Braiding Hair), which was about $4/pack at my local beauty supply. My sister gave me 3 packs and then I bought a couple extras just in case. I used 3.5 packs and then... I basically gave up. Ha! This all happened over two days. I don't like sitting for too many hours at once and just doing the style straight through because I get bored. Maybe I should try it that way next time though. I definitely could have used another pack of hair to fill it in more and do a better job covering up my own braids, but umm... I got tired!! I made the mistake of putting most of the hair in before I started braiding it. OMG ladies never do that!! It created so much more work for me than was necessary. Which is probably the real reason I got tired and gave up. If I were to do this style again, I would definitely braid as I put the hair in. I don't know what I was thinking ya'll. The hair started blending together and I had to be extra careful to separate it since it hadn't been secured on my head yet and could basically slide right out from under the braids. Sigh. Bad idea Melanie. Bad idea. Lesson learned. Other than that little mishap, I love the braids! 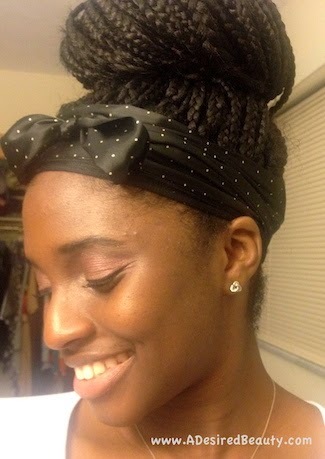 It's like all the fun of box braids without any of the "Aaaahh-I'm-bout-to-lose-my-edges" hassle! No "Eeek-my-braids-are-so-tight-I-could-cry" moments! Yessss! That's a win. After I was finished braiding, I dipped the ends of the hair in hot water to set the braids. That's it! I love that it looks like I really have braids in my hair. I could even get them up into a high bun! I've had them in for a little while now and am enjoying styling them. The only problem I'm running into right now is excessive dryness. It's so weird, too. I'm moisturizing and sealing just as I have with my other protective styles, but the next day my hair will be bone dry as if I've never attempted to moisturize it. I'm beginning to suspect it's just the hair that I used that is drying my hair out. No good. I really liked working with this non-tangle prone hair, but I will definitely be taking these out sooner than planned if my hair keeps up this way. Either way I'm gonna rock it as long as I can! I like the fact your edges are free from the tugging and pulling. Didn't know there was so much versatility with crotchet braids. Right! That's my favorite part, Tomes! I had crochet braids years ago and walked away from them when they went out of style. I will be revisiting them very soon.